Adopted son of Odin, second in line to the throne of Asgard. Loki wanted only to please his father, but his Frost Giant heritage and his jealousy of his brother Thor made him dangerous. Now, he hopes to turn Earth into his own personal kingdom, even if he has to destroy it first. Loki's colors didn't change between Thor and Avengers, but his outfit got a lot more ornate. He has a similar helmet, and his cape still comes out of his shoulder pads, but he's wearing a long coat rather than just chest armor. The entire chest cap is sculpted (the way Rustin hates to see), and the body beneath is unpainted. The detail on the arms and legs is painted, and looks very nice. He has new forearm plates, and comes with his pointy staff. 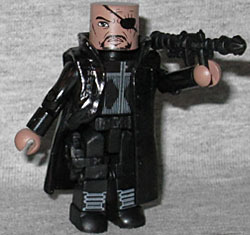 This is our second Samuel L. Jackson Minimate, and our third if you count ones that are clearly supposed to be him. This one is bald, has an eyepatch, and is wearing all-black. Variety! His coat is new, and he does have some painted details on his chest and shins. There's a pistol in a holster on his right leg, and he comes with a rocket launcher, to shoot down SHIELD aircraft. Actually, when that scene was in the trailers, I thought Fury was going to be revealed as a Skrull (also, this was when we were all under the impression the aliens in the film were going to be Skrulls). If that had been true, how funny would it have been if the Avengers fought their way onto the mothership, and in a holding cell, found David Hasselhoff sitting there waiting to be rescued? 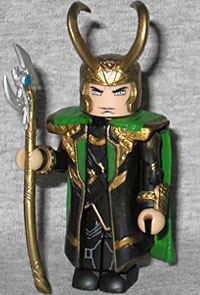 This entry was posted in Art Asylum, Marvel, MMMR and tagged Avengers, Minimates, Thor. Bookmark the permalink. The Octopus from The Spirit line.